Is it possible to pre-plan one's spiritual walk? Is a church "plant" even biblical? Ridiculous questions, you say? Maybe, but stay with me for a minute and I will try and explain where I'm going with this. Many of us say that we are "Spirit-filled" or "Born of the Spirit" or simply "Born Again." While sometimes I may have silently questioned that among some based upon their lifestyles, my point is not to discern the truth or falsehood among those of us who have made such professions. My point is simply to consider something that Jesus said to Nicodemus about being born of the Spirit and then to look how that example relates to many of our Christian walks today. The first thing I see here is that a Spirit-filled (or born again) believer is likened to the wind. In other words, you know when they're there and when they're not. Likewise you're not sure where they were last nor where they'll be next. They're completely free (like the wind) and not tied down anywhere. They will blow in and blow out, sometimes at what we deem appropriate times, and other times what we deem inappropriate. It is as impossible to tie them down as it is impossible to tie down the wind. Having said that, please allow me to digress for a moment in order to consider another question. What comes to mind when I say "Church Plant?" What probably comes to mind is that we think of a new Christian work in a specific geographical area. It likely starts with an individual or small group of a few families. It may begin my meeting in a home or rented school gymnasium. It often will eventually also include some sort of building program. The very word "plant" also suggests that, whatever was planted, has also taken root and become essentially immovable. I saw a wall hanging in someone's home years ago that said, "Bloom where you are planted." It was nice, it sounded pleasant, it was in a beautiful Christian home, but is "Bloom where you are planted" a truly Christian concept? 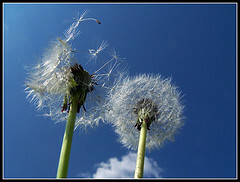 Are Christians to be planted or free like the wind? For me this raises an important question concerning how we deal with the traditional institutional church building. It is planted and has taken root. Likewise the Christians that call that place their church home are often also planted and have taken root. When I belonged to a specific institutional church system years ago, virtually everything that we did concerning our faith was in that place. We had clearly taken root. The vast majority of what many of us do today in the practise of our faith is rooted to a specific place, that is, a church building. Please understand, this is not intended as a judgement call; it is simply an observation. Certainly the Spirit of God can and has moved in such places. No doubt the Spirit will yet move in any place where Christians are gathered. "Where two or three are gathered ..." I get all that. But what I am wondering about concerns the Spirit in us. If everyone born of the Spirit is like the wind, am I right to assume that a Spirit-filled Christian will never take root anywhere, but will also come and go in complete freedom - like the wind? It may be that the Spirit of God takes us into an institutional church building from time to time, but I do not believe that He does so in order to plant us there and have us take root. When He does so, is it fair to say that He blows us in like the wind to minister to or bless an individual or group? In that case, the individual or group doesn't know where we came from or where we are going next any more than they can identify the coming and going of the wind. It may be that the Spirit of God takes us to a nursing home instead on a Sunday morning, because in that home there is a dear old saint who is feeling all alone and who has been praying to God about his or her solitude. As a Spirit-filled Christian, could it be that the Lord suddenly blows you or me into that seniors lodge in answer to that saint's prayer? Could it be that God's blessing to that saint comes by you or me spending an hour or two Sunday morning having coffee there instead? It may be that the Spirit of God takes us to a decrepit downtown park instead on a Sunday morning, because He wants to introduce you and me to a homeless person who is even now considering suicide. This person doesn't need our judgement; he only needs to know that someone cares. So grab a couple coffee's and BigMac's and go to the park. The Spirit within will guide us to just the right person. Often the best sermon people will hear is YOU. The tendency is to be planted. Though it is the human way, Jesus seemed to say to Nicodemus that it was not the Spirit way. The Spirit way is "as the wind blows." The Spirit way is discovered by listening and constantly moving. The Spirit way may visit those on the pews, but doesn't take up residency there.